SawyerFill your hydration pack directly from your screw on/off filter without removing it from your backpack with this accessory. (Hydration pack not included) Details - Fill your hydration pack directly from your filter without removing thebladder from you backpack. Here�s how: 1. Cut the drinking tube where you want to add the Fast Fill quick disconnects. We recommend cutting the tube 1.5 inches from the bite valve. 2. Attach the female quick disconnect to the tubing leading to the hydration bladder and the male quick disconnect to the tubing attached the bite valve. 3. Remove the push pull cap from your filter and attach the blue Fast Fill adapter. 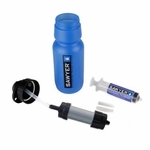 Connect the Fast Fill adapter to the quick disconnect on your drink tube and slowly squeeze the Sawyer pouch to fill the bladder.